Celestyn “Cel” M. Maciejewski, age 93, formerly of North Holden Street, Port Washington, WI passed away peacefully Wednesday, January 23, 2019 at the Harbor Club in Port Washington. He was born on October 11, 1925 in Lessor, WI; son of Stanley and Helen Jach Maciejewski. As a young man, Cel traveled to Milwaukee to learn a trade. While working at a Milwaukee bakery, Cel entered the US Navy, serving his country from 1943 through 1946 as a Ships Cook 2nd Class. On September 6, 1947, Cel married Irene Kumrai of Milwaukee. The family would later move to the town of Saukville to operate a family farm. In the late 1960’s, Cel ran Cel’s Bar & Grill on North Mill Street in Saukville (currently J’s Bar & Grill) with the family residing upstairs. Cel was an accomplished mason and member of the Bricklayers and Allied Craftsmen Union Local 8 of Milwaukee and worked for Moldenhauer Construction of Grafton for more than 20 years. He continued to do mason work on his own, creating fire brick furnaces. In 1977, the family would move to Port Washington. 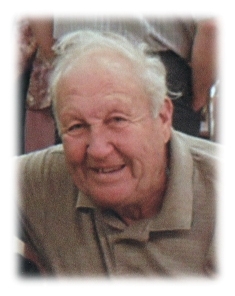 His wife Irene passed away on November 21, 2010 and in 2011, Cel moved to the Harbor Village in Port Washington. He enjoyed sports. He was involved in many bowling leagues and played softball for Bink’s Bar, amongst others, for many years in Port Washington. Cel played in the Grafton senior League also. He was active at the Port Washington Senior Center, its Green Felt Club, horseshoes and playing cards. Cel was a member of the Landt-Thiel American Legion Post 470 in Saukville and the Waubeka Flag Day Post 7037 Veterans of Foreign Wars. He was an active member of the Port Washington Leathernecks and their Fish Day tent every summer. He was a proud participant with the Stars and Stripes Honor Flight in May, 2010. Immaculate Conception Parish in Saukville was his home for many years. He will be remembered as one of the co-founders of the Saukville Sports Day for local youth often held in the parish gym. He was also a member of the Knights of Columbus Ozaukee Council 2035 for over 60 years and always enjoyed a good polka. Cel is survived by his children Sharon (Milt) Rennicke of West Bend, Dwight (Joanne) Maciejewski of Port Washington, Kevin Maciejewski of Phoenix, Lynn (David) DeBroux of Menomonee Falls, Lois Ebert of Port Washington, Neal (Heidi) Maciejewski of the town of Grafton and Sandy (Dennis) Carroll of Port Washington, 13 grandchildren, 10 great-grandchildren, sister-in-law Shirley (Morgan) Robinson of Cudahy, nieces, nephews, other relatives and friends. He is preceded in death by his wife Irene, infant daughter Mary, infant son Keith, granddaughter Ana Rose Maciejewski and his sisters Adeline Maciejewski, Caroline Reinke and Jeanette Fierst. Cel’s funeral mass will be celebrated at 4PM FRIDAY, February 1, 2019 at St. John XXIII Parish-St. Peter of Alcantara Church, 1800 N Wisconsin Street, Port Washington, WI. Military honors will follow the Mass. Reverend Patrick Wendt will be the celebrant. Visitation will take place from 2-3:30PM FRIDAY prior to Mass AT CHURCH. A Knights of Columbus vigil and veterans walk-thru will precede the Mass at 3:30PM. Entombment will take place at St. Mary’s Cemetery in Port Washington. Memorials to the Port Washington Senior Center, 403 W. Foster Street, Port Washington, WI 53074 or the Landt-Thiel American Legion Post 470, 601 W. Dekora Street, Saukville, WI 53080 appreciated.